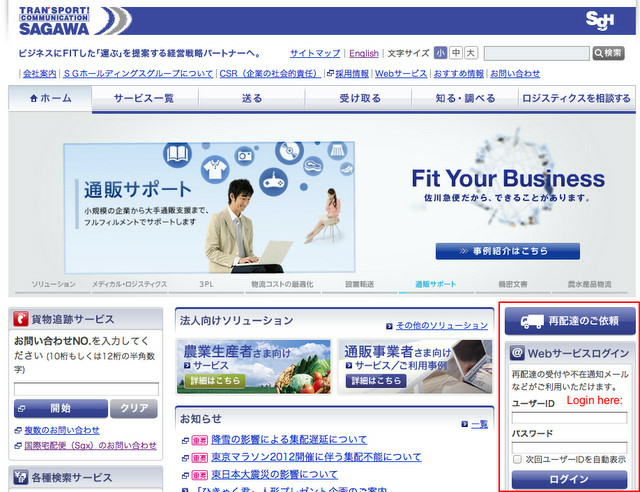 Last week I showed you how to create an online account with Sagawa so that this week you can learn how to request a redelivery with Sagawa completely online. All you need is your account already set up (make sure you know your username and password) and the missed delivery slip left by the driver. 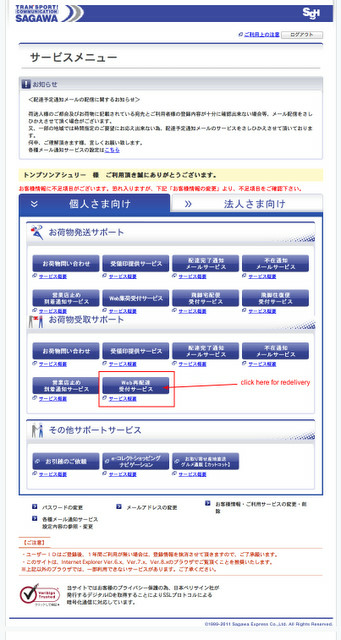 Go to Sagawa's main site and find the login area on the right hand side (see red outline below). Enter your username and password (the ones you chose when you set up an account from the previous post). Once you've logged in, scroll down until you see the redelivery kanji (surrounded by a red box in the picture below). Says Web再配達受付サービス. 再配達 is redelivery (さいはいたつ). Make sure the store number is correct (the redelivery slip they left for you will indicate the correct number, and if your address is listed in the account the default store number should automatically show up. 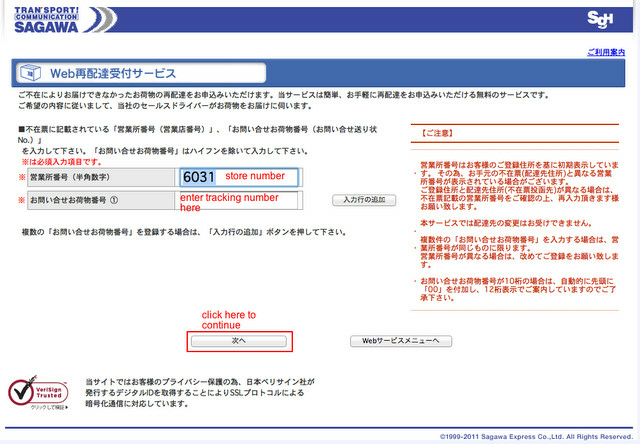 Enter the tracking number in the next blank space, and click 次へ to continue. Choose your requested redelivery date and time in the top two slots (if desired - otherwise leave them as their default options). Then check that your personal information is correct (phone number and address). If you want to receive a confirmation message, choose which option (computer or cell phone, or the third option "don't send," if you don't want one). 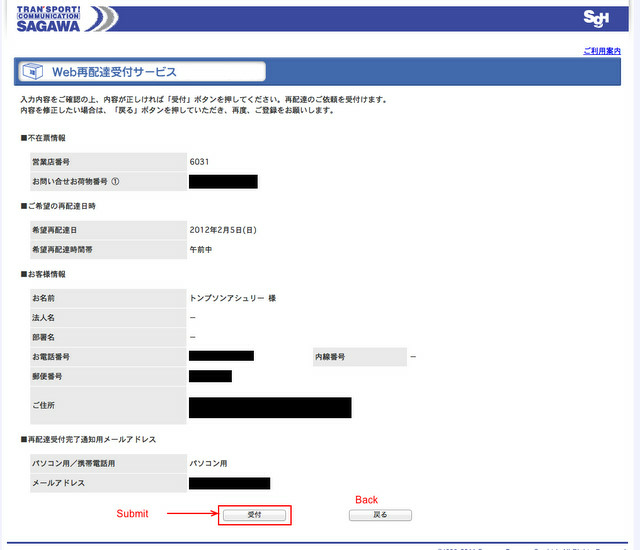 Enter your email address twice and click 次へ to continue. 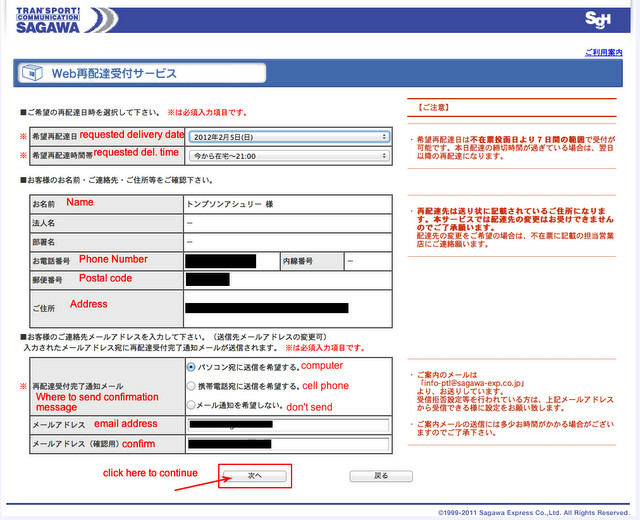 Check over your information to ensure everything is correct, and then press 受付 to submit. You should receive a confirmation email if you chose that option. Congrats! You've successfully requested a Sagawa redelivery online.